Two of the most popular political terms in the world are still two of the most esoteric and abused terms today: ‘left,’ and ‘right.’ These terms are constantly misused; they need to be fleshed out actually to understand what they are, to whom they refer and why they are wholly irrelevant in the modern age. For a period of time around the French Revolution, certain mindsets got their labels by where they sat on a particular side of the National Assembly. Conservatives sat on the right side and liberals sat on the left side. These two terms, the left and the right, have been embedded in Western political vernacular ever since. Like every other system in the West, this has been deconstructed over time, and while the system of ‘sitting in the correct spot’ is gone, the labels remain. As it stands, labels like ‘conservative’, ‘right’ and ‘far-right’ have been mishandled, reconstructed and thrown around so recklessly that they no longer mean anything, and one has to wonder if we even need them at all anymore. In the modern age, when politically-minded statements use the terms ‘left’ and ‘right’, they are not referring to a legislature, but rather to a popularized political chart. When the media and other political analysts want to show you a political diagram, they use something like the following. It is a diagram the younger generations were taught in school. Conservatives are right-wing, liberals are left-wing. 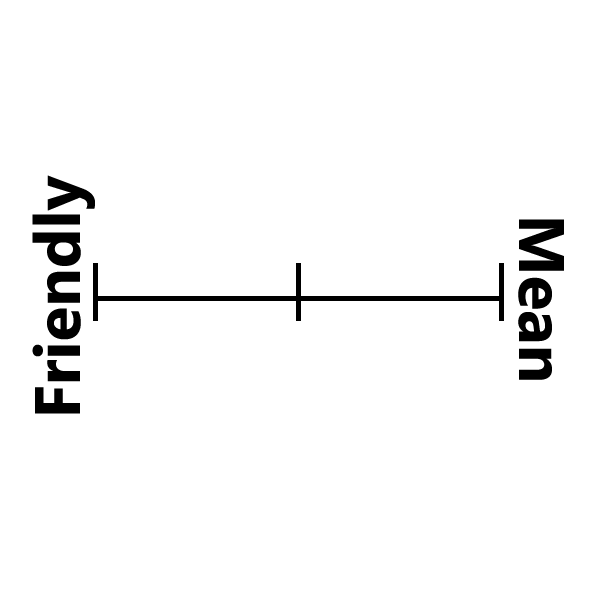 Anything mean-spirited is right-wing, and anything friendly is left-wing. 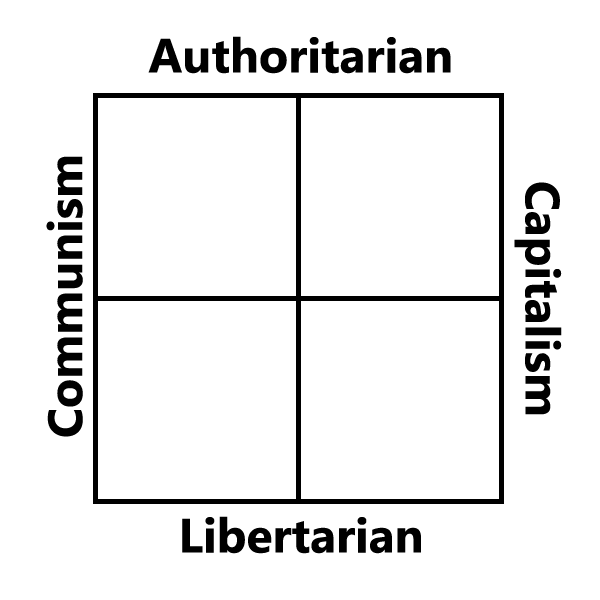 The political compass, a visual depiction of general political beliefs of a person, has long been touted as the best way to define those beliefs, with the left being liberal and the right being conservative. The vertical axis of this graph has libertarian at the bottom and authoritarian at the top. Because many people in positions of power tend to ignore the existence of the vertical axis, they constantly mislabel and misrepresent both right and left-wing politics; many times, this is done on purpose. The slant on these kinds of diagrams is always glaring when one is aware of them. Are these ‘extreme far-right’ groups just extreme capitalists? Plutocrats? It is a foolish declaration, and only one a mental child would make. What was a conservative? Someone who didn’t want to change anything. Literally, conservation, and the more conservative, the less they wanted to change, and thus the more ‘right’ they were. What was a liberal? Someone who wanted change, usually with a focus on social issues. With the post-60s rebranding of everything, these general ideologies were replaced by something more akin to brand names or sports teams, of Conservatives and Liberals – two brands which now have far too much in common. Liberalism became about varying levels of Communism and cowardice, and Conservatism became about Capitalism and foreign interventionism. The reinvention of the political landscape happened across the western world at roughly the same time. The left-right dichotomy mutated from being the change vs. no-change axis, and instead became the Communism-Capitalism axis. Few took notice, even as political tests were made to fulfill these new definitions. Fewer still took notice when the Capitalists and the Communists eventually met, and created their freak of nature, Globalism, an ideology that would be extremely valuable to them and extremely punishing to their opponents. The left side wanted Globalism for a removal of all borders to mix peoples into a bland, brown mass. The right side wanted Globalism for exploitation of cheap labour and to turn the West into a global shopping mall for massive profits. Both lead to white cultures dying out. Workers and church-goers were not interested in bombing foreign nations or sending their jobs overseas, and scholars and philosophers were not interested in becoming mindless masses of drones. Still, however, the genuine people continued to vote, ignorantly fooled by the names, though neither of these parties represented the political alignment they thought they did, and neither of these parties truly had their interests at heart. Both parties became about mass immigration, sexual deviance, and social reversal, just on a slightly different time scale. The left wanted to push harder and break more things, to engender more deviance, to host more immigrants. The right wanted to conduct more wars of intervention and corporatism, build (and sell) more bombs, create more refugees. Whatever the left and right once meant was now totally spread to the wind, but the terms continued to live on artificially. 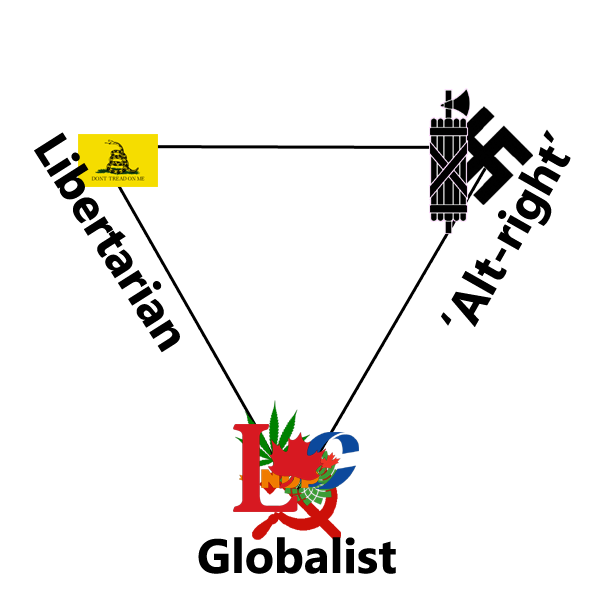 Now, when the media and the generations who have lapped up their misinformation and blatant lies call out a target who does not like either flavour of Globalism, he is labeled ‘far-right,’ sometimes ‘extreme far-right.’ Naturally, these people are not far-right, but it is a prime example of how these enemies only think in juvenile terms, their moral compasses working on a single-axis chart of emotion. The meaning of the right has long since been destroyed, but they still use its ghost to frighten people. Naturally, the terms ‘nazi’, ‘fascist’, ‘bigot’, ‘misogynist’ and the like get thrown about as well. The National Socialists were, of course, not on the ‘right,’ nor were they on the ‘left.’ The same applies to fascists. They were high on the authoritarian axis, yes, but this did not put them ‘on the right.’ They were, for the most part, centrist, with some of the best of both sides of the left-right axis. Simply put, ‘bigot’ and ‘misogynist’ were terms taken up by the Communists as attack words, and thus held no weight at all in terms of this archaic graph. Out of the smoke of the old-school Liberals rose a new side: the Libertarian. Occupying the bottom part of the axis, Libertarians, overall, do not care about rules or systems, and simply wish to be left alone to do as they please. The more vocal ones want to ensure that there is a system of non-aggression, that the freedom put forth was not used to force others to lose their freedom. Libertarianism is oftentimes extremely close to complete anarchy, and in an anarchy, whoever is the strongest will become the leader, and Libertarianism falls apart. Thus, Libertarianism is mainly too fragile and individualistic to apply on a large scale. 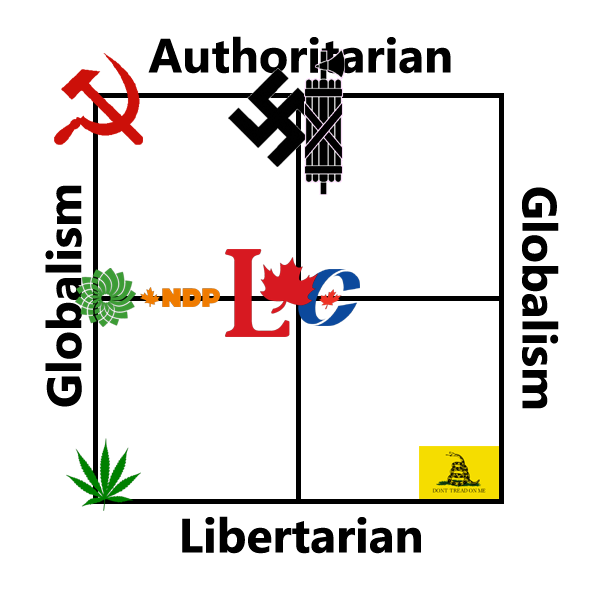 On the political graph that the world still tries to think in, Canada would look like this, adding in a couple of extra symbols to denote other popular methods of thought. While all of the groups borrow something from something else, they are all firmly in their particular corner of the triangle. This really leaves people with three things to notice: One, that Libertarianism is basically all alone, as the ideology is essentially about individualism. Two, Fascism and National Socialism are within the wheelhouse of the Alt-Right. The third, but most important, that Canada is totally inundated with Globalist parties that are all jammed in the same puny corner of thought. To expand on this: Libertarianism is so individualistic that it will either fail, or cause a country to crumble to the point that it will simply be annexed by a stronger neighbour. 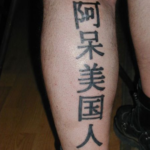 It is also an incredibly white phenomenon, as no other culture on earth practices such freedom and trust. Most non-whites consistently vote for Globalist policies, and many Libertarians realize that such a high-trust society can only exist within a nation that is homogenously white, and can only exist next to one that is the same. This leads people to stray away from it slightly. For the standard fare of parties, there is a reason why you always feel like there is nobody to vote for, that they are all basically the same; you are right, though the media will beat you over the head with buzzwords until you change your mind. They have a different veneer, but are overall the same party with mainly interchangeable messages, leadership and emblems. They are a scarecrow, a dummy, and no matter what face you stick on it, it is still going to be the same stuffed shirt. As for the Alt-Right, many views of it are true: it does have many ideas and desires that are similar to that of old movements which the Globalists decry as bad, simply because it is a stance that is in oppositon to Globalism. 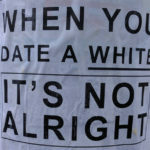 However, it is important to note that the Alt-Right is not an emulation of the National Socialists, the Fascists, the Falangists, or whatever other movement from the past. The Alt-Right gathers ideas from across time, rethinks strategies from many successes, and tailors policies specifically to their country, to their sphere of influence. Only the German Alt-Right wants genuinely to be German. The American Alt-Right wants to be American, and the Canadian Alt-Right wants to be Canadian. Because of this, the label that best fits the Alt-Right, aside from the eponymous, is Nationalist. The Globalist cares about intervention, Communism, and sexual deviance. The Libertarian cares about liberty, property and individualism. The Nationalist cares about faith, folk, and family. It is time that the notions of ‘left’, ‘right’ and all of these archaic terms be scrapped, because they are simply not satisfactory anymore. Continuing to use them can only help the arguments of the Globalist, because their use means that you will be positioning yourself within their framework, which they have far more success in making use of. If you play the enemy’s game, they will beat you at it, because they have created it.